Barack Hussein Obama II (genys 4 mis Est, 1961) o 44ves Lywydh a'n Statys Unys a-dhia an 20ves a vis Genver 2009 bys an 20ves a vis Genver 2017. 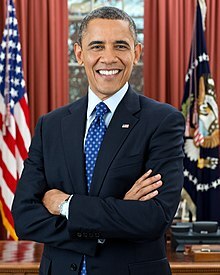 Obama yw an kynsa lywydh Afrikek-Amerikanek a'n Statys Unys. Ev a veu dasetholys yn 2012. Ev a veu genys yn Hawaii. Y vamm o Stanley Anne Dunham, dre vras Sowsnek hy linyeth, ha'y das, Barack Obama Sr o Luo dhyworth Nyang’oma Kogelo, yn Kenya. Gradhesik Pennskol Columbia ha Skol Lagh Harvard may servya ev avel lywydh Dasweles Lagh Harvard. Ev a oberi avel laghyas gwiryow kemmyn kyns bos etholys yn Senedh Illinois, ow servya yntra 1997 ha 2004. Yn 2004, hag ev ow kesstrivya rag Senedh Statys Unys, areth gresel a ros ev dhe'n Kuntelles Demokratek Gwlasek, may teuth ev ha bos aswonnys gwell dredhi. Ev a waynyas esedh senedh Ilinois, ow servya a 2004 dhe 2008. Ev a gesstriva yn sewen ogas erbynn Hillary Rodham Clinton rag an hanwesigeth Dhemokratek, hag a fethas ombrofyer Parti Repoblek John McCain yn etholans lywydhek 2008. ↑ "Birth Certificate of Barack Obama". Department of Health, Hawaii.PolitiFact.com. 9 Est 1961. Retrieved 2008-12-12. ↑ Levenson, Michael; Saltzman, Jonathan (28 Gen, 2007). "At Harvard Law, a unifying voice". The Boston Globe. p. 1A. Retrieved 15 Metheven, 2008. Diwettha chanj an folen ma a veu an 23 Hedra 2018, dhe 06:08.